1 taro peeled and sliced on a mandolin at about 1-2 mm thick. Blend the coconut, roughly chopped ginger, peeled garlic and lime leaves in a blender until bread crumb like. Add salt, pepper, breadcrumbs and melted butter and blend again to combine. 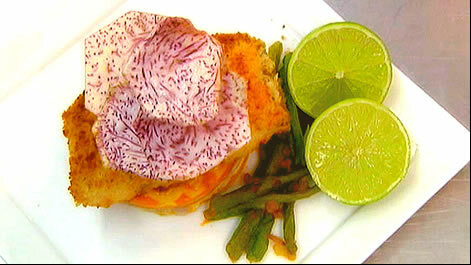 Place the coconut mix on the top of the barramundi quite generously and place onto greased baking tray. Bake at 160-180 degrees for around 12-15 minutes. Peel and thinly slice all three vegetables on a mandolin at a 2-3mm thickness. Place in 3 separate bowls. Mix the coconut cream with lime leaves, garlic, eggs and salt/pepper and divide evenly, pouring over the vegetables. Toss and place alternate layers of each vegetable into a lined baking tin. Bake at 160-180 degrees for 20-25 minutes. Cut out with a round cutter or cut into squares to prevent any wastage. Whisk all ingredients together to form a smooth batter. Place taro stems into batter and deep or shallow fry for three minutes. Shallow or deep fry in hot oil for 3 minutes or until crispy. Salt to taste. Use as a garnish on top of barramundi.